It was invented due to the need to use the best parts of the meat discarded in the preparation of sausages, stuffing them into casings after being flavored with spices and spirits, and cooking them in water. It is a product of medieval origin, characterized by the original presence of alchermes, a bright red liqueur once obtained from cochineal, the famous dye used as coloring and flavoring, together with lots of spices, used for preserving the product. The diffusion of this delicacy was largely thanks to the large network of artificial canals that cross the Prato plain, which starting in the Middle Ages led to the development of the Arte dei Beccai (butchers’ guild). The first documents concerning Mortadella di Prato PGI as a product originating in the city of Prato date back to 1733. The cuts, processed manually with the aid of a knife, are left to rest for at least 24 hours in cold storage to allow the meat to be cut accurately and the external muscular parts to be completely removed; the meat is subsequently cut into cubes. All the meat, excluding the lard, is first ground in the meat grinder and then mixed for 3-10 minutes with the cubes of lard, sea salt, garlic, pepper, and ground spices. Alchermes is then poured into the mixture which is then mixed again. It is put in a natural or synthetic casing; at this stage takes place the “stewing”: the product is hung in special rooms that ensure a gradual decrease in temperature over a period of time comprised between 1 and 3 days, depending on the size of the product. The product is then cooked either in a steam oven or in a boiler by being immersed in water at room temperature, which is then brought to 100°C. Once cooked, the product is rinsed and cooled in a refrigerator cell or blast chiller. On the next stage, it is dried, so the Mortadella di Prato PGI is not subjected to sudden changes in temperature or humidity, which in addition to causing the risk of microbial proliferation, would irreparably destroy the delicate organoleptic balance of the product, thereby affecting the aroma and altering its characteristic pink color. Externally the product can be smooth or rough, depending on the casing used; the consistency of the mixture is firm and compact, soft to the palate. The external color of Mortadella di Prato PGI is pink tending to dull; inside it is a brighter pink due to the coloring action of the alchermes, with white spots attributable to the presence of cubes of fat. It has a penetrating spicy aroma, while there is a contrast between the hot and pungent flavor of the spices, garlic and sea salt and the sweet and delicate flavor of the alchermes. 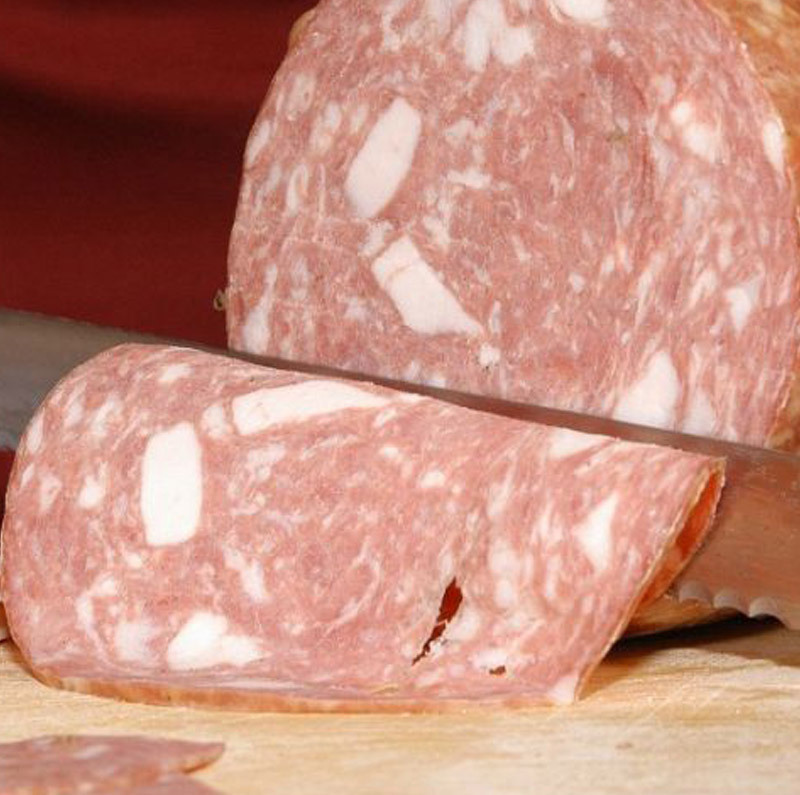 Even the name ‘mortadella’ reminds the classic pink deli meat from Bologna, Mortadella di Prato PGI is actually something more like a cooked salami. The use of alchermes as an ingredient is a clear indicator of its Prato origins: it is a bright red liqueur, once obtained exclusively from cochineal, a dried and ground parasitic insect which for centuries has been used to dye fabrics, traditionally the city’s main economic activity. Protected Geographical Indication (PGI) recognized under Regulation EU Regulation 32 of 09.02.2016.